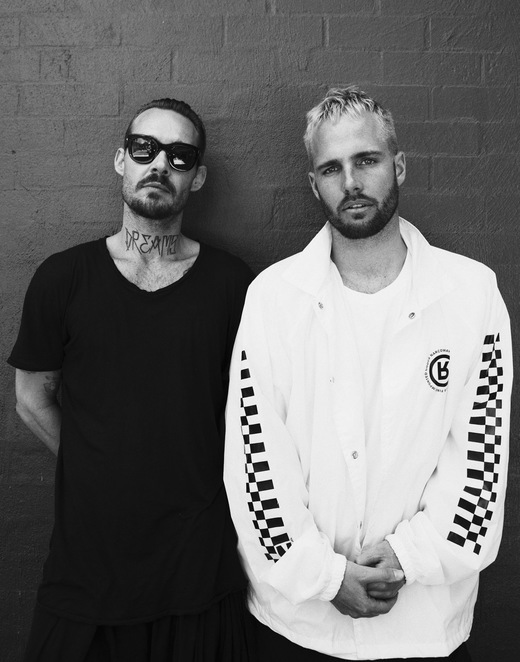 Emoh from What So Not and Daniel Johns. Image courtesy of Facebook. Emoh from What So Not took a moment to chat about his upcoming album, Not All The Beautiful Things. Previously having released singles and E.Ps, this is his first full-length album, and you can hear a sneak-peak plus a review of all the tracks here. Note: Responses may have been edited for length and or clarity. Q: After releasing multiple singles and E.P's, what was the inspiration behind releasing a full album? WSN: I did a more extensive E.P, and it made me realise the power of releasing a body of work; where you don't have to please everyone with just a 3-minute snippet. I found it gave you the freedom to create something cinematic. I guess what got me excited was an outtake called Adieu, which became the most downloaded song from the E.P and which got me excited about the the potential with a full album; taking into account the music videos and the stage design like what I put together for Coachella. I wanted to create a colour pallet and bridge videos and music together to create a full dynamic experience. A full album allowed me to do all that. Q: Whilst creating an album, did you plan ahead where the album was going to take the listener or was it a case of seeing where the creative process would take you? How different was the creative process of making an album vs making an E.P? WSN: Well I had about 100 demos that had to be refined down to 12 complete songs, so there was a lot of testing and cutting that went on. An album is also limited by its commercial length of 45 minutes. Q: Your music includes a variety of random samples, such as rosellas, and a flipping coin, how do you decide the missing beats to a song? WSN: Often it's trial and error, sometimes you need to take some space (like a few months off) and come back to a song with new techniques, equipment and rework the song. Maybe even complete one new section at a time and perhaps that's the missing piece. Q: You've collaborated with a vast array of creative geniuses, how did you get to work with Skrillex, Toto and Daniel Johns on the same album? WSN: Skrillex has been a good friend, for years and he signed me to his label. I also went on tour with Skrillex. Daniel Johns wandered past the studio in Sydney I was working in, and was curious and ended up staying and we worked together on some samples. He then invited me up to his home studio where we wrote tons of music and narratives. Toto is a great story actually. I was playing Toto in a bunch of my songs from their album Africa, and Skrillex started doing the same and mentioned me as his inspiration, so much so the song Africa re-entered the charts. Rolling Stone then asked Skrillex and Toto if they wanted to collaborate with an Australian electronic producer and they agreed. What was unique was it was their first dance and electronic music they had worked on and they've performed with the likes of Michael Jackson and Ringo Starr. It was amazing to just be in the studio with them. Q: Who else would you love to collaborate with? WSN: I'm happy to work with anyone with great energy. I'm not going to restrict myself to a certain style or calibre of artist. I spent a week in New Orleans with jazz musicians and it was exciting working with actual musicians and recording samples and then bringing that into my work. It was a totally different experience working with real instruments and something that I'll continue to explore. Q: It sounds like Daniel Johns had a bit of influence on this album, what was the greatest lesson you learnt from him? WSN: One thing he taught me and which was probably the greatest lesson I learnt, was on the song Be Ok again. I'd never sung on a song and I nervously shared it with him, but he encouraged me to keep my voice in there. I asked "is it too corny?" and he said "nothing's ever corny if you sing it like you mean it. If you deliver it with passion, you can make anything work." Q: When you're not creating your own music, who are you listening to? WSN: That's a great question. When I was making this album, I stopped listening to all current music and went backwards. I listened to defining albums and only listened to those which had a profound impact over time. I listened to albums like the Fugees, The Gorillas and Led Zepellin. Q: When you're touring overseas, I know your schedule is pretty tight, but which country really stood out to you and is one that you'd like to go back to and explore more in depth? WSN: Oh I can't play favourites, travelling really opened up my eyes that there's a much bigger world than what I knew in Australia and there's so much variance, even from city to city within a country such as from New York to Atlanta, and from Los Angeles to Denver, they're all totally different. I loved all the different music scenes in Europe like Paris compared to Berlin. There's not one single country that stood out over any other. Q: What's your most treasured souvenir you've picked up on your travels? WSN: I don't really pick up souvenirs as such but I write a lot of songs when I'm travelling, so I'm inspired by the places I go to and often I'll name a song after a city. I'll be so inspired by the place that on occasion, I couldn't finish a song unless I went back to the city I started writing it in. Q: Lastly Once the new album is released, what's on the cards for you? Is it straight back to the studio to work on another album? WSN: By the time the album is released I'll have a world tour announced, so it all depends on how the album is received and the tour will take up most of 2018, so I'm not sure beyond that. What So Not's new Album, Not All The Beautiful Things is released March 9. You can listen to a preview here. 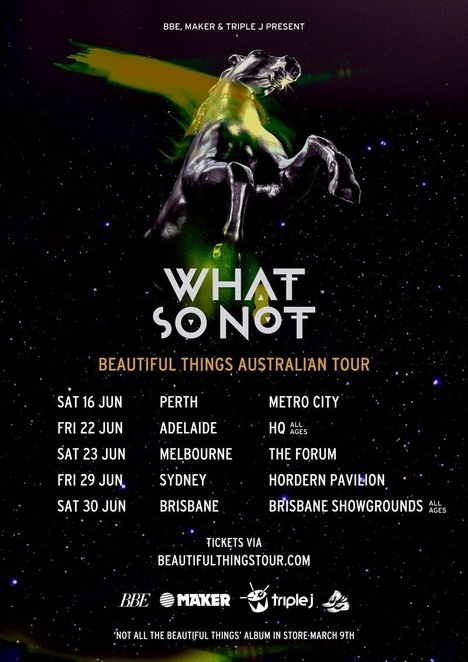 What So Not will tour Australia in June. Image courtesy of Facebook. Why? Talented and popular Australian musician with a groundbreaking new album. When: New album is released on 9th March 2018. Cost: A single track on iTunes is $1.69, the full album is $12.99 to pre-order, or you can listen for free with a three month trial to Apple Music.